Math professors Jim Fowler (left) and Luis Casian (right) are working with other faculty members in the state of Ohio, reinventing the way math is taught, thought about and learned at high school and university levels through the Ohio Math Initiative, outreach programs in the community, and summer programs for underrepresented minority students interested in the discipline. Ohio State’s Department of Mathematics is a powerhouse. Some of the world’s top experts in diverse fields of mathematics call it home, and it is leading a strategic charge in an ambitious effort to change the way we learn — and think — about mathematics. Mathematics allows us not only to advance science and technology, but also to think better and successfully navigate everyday life. While many of us struggle with it (calculus, anyone? ), there is now proof that mastery begins by creating individual pathways to learning mathematics, from K-12 to BS, MS and even PhD. For decades, Ohio State has led the way in implementing initiatives, establishing programs and devising creative ways of outreach — all with the aim to make the world of mathematics more accessible, more intuitive and more fun. Since 2013, the Ohio Math Initiative, a collaboration among faculty from Ohio’s public colleges, universities and high schools, has been rethinking and revising how math courses and curricula integrate and correspond to other disciplines. While chair of Ohio State’s Department of Mathematics, Luis Casian, now the college's dean for natural and mathematical sciences, helped lead efforts to help students find their perfect fit by matching appropriate courses to diverse majors and programs of study. Casian and others in the department are developing courses for students in multiple academic disciplines, along with interdisciplinary tracks in the honors program, such as tracks in financial mathematics and computation. Ohio mathematicians’ ideas are being emulated in at least 10 other states, and their progress is attracting national attention. In 2016, Casian was part of an Ohio contingent presenting “Multiple Pathways: A Successful Case Study” at the national Transforming Post-Secondary Education in Mathematics Conference in Washington, D.C., where Ohio was cited as leading the nation in making the language of mathematics accessible. Ohio State has long been a leader in meaningful mathematics education and outreach, and a trio of summer math programs have paved the way to enhancing Ohio State’s mathematics learning experience. For more than 60 years, the Ross Mathematics Program, founded by Arnold Ross — world-renowned mathematician and former chair of the Department of Mathematics (1963-1976) — has provided instruction for gifted pre-college students in the art of mathematical thinking. It has inspired generations to discover the value of abstract ideas. The six-week program runs each summer and has been the model to imitate. Now taught by Assistant Professor Jim Fowler, Professor Emeritus Dan Shapiro and others, its alumni include some of the world’s brightest stars in science, math, business, technology and the arts. As proof that math is a universal language, Ross/Asia, held this year in China at Chenshan School in Huangshan City, Anhui Province, just finished its third successful year. Sampling Advanced Mathematics for Minority Students (SAMMS) is relatively newer to the Department of Mathematics, but its impact has made waves around the globe. Since 2011, SAMMS — designed by Casian, other Ohio State faculty and colleagues at the University of Puerto Rico, Mayagüez — has provided undergraduates from traditionally underrepresented minority groups the opportunity to test the waters of graduate mathematics before diving in. The four-week course offers additional graduate school preparation activities, such as working with faculty on math projects and presenting work. Many of its graduates go on to be successful in graduate programs, including here at Ohio State, where several SAMMS alumni have received their master’s degrees or are working toward their PhD. Finally, Beyond the Classroom: Girls Exploring Math, invites high school-aged girls to the STEAM Factory downtown to participate in engaging activities that help them develop a deeper understanding of mathematical and algorithmic reasoning and problem-solving skills. The program surrounds participants in a supportive atmosphere and uses nontraditional means to cultivate a deeper appreciation of mathematics. 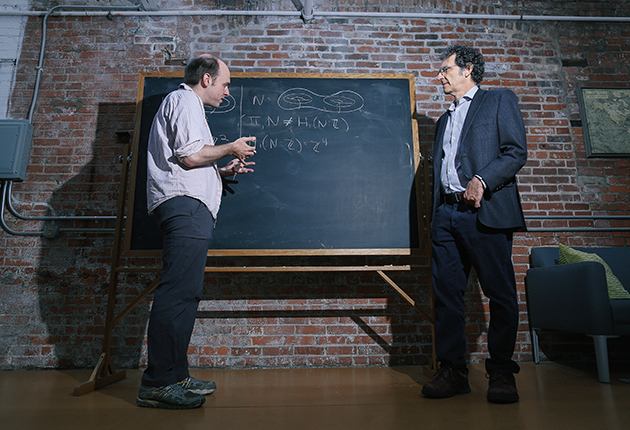 Located in downtown Columbus, The STEAM Factory, pictured here, provides a space where Ohio State researchers, like Jim Fowler (left) and Luis Casian (right), can broaden their perspectives, share resources, spark creative research ideas and form collaborations across areas of common interest. Mathematicians aren’t just developing more palatable courses and content for non-STEM majors. They are challenging themselves to rethink how they deliver that content. When it comes to transforming the mathematically challenged into mathletes, Jim Fowler is a math maven. He is on a mission to reveal the magical properties of mathematics, encouraging both the gifted and the uninspired. The scope of Fowler’s reach beyond just his classroom is boundless, and he strives to find innovative ways to help others learn. He teaches at the STEAM Factory, speaks at local schools and has given TED talks. He has a substantial following on YouTube, where his quick, engaging videos about math properties have more than 3.2 million views, and his channel has more than 20,000 subscribers. Fowler also teaches the world’s first, most watched, award-winning online calculus course — Mooculus. When it premiered in 2013 on iTunes, it had 150,000 downloads and 186,000 streams, and the course is still thriving. Fowler believes that a lot of math anxiety has to do with being expected to get a right answer rather than being allowed to feel comfortable with confusion and uncertainty. Ohio State’s Department of Mathematics has a track record not only of providing top-notch education, but also of identifying ways to engage learners and advance students through a variety of different fields and careers. The department has established itself as a leader in providing multiple avenues of outreach, and it is dedicated to continuing and maintaining that trend. The Ohio State math professor has been frequently recognized for his creative approaches to making the subject more accessible. Through online learning, virtual reality and sheer force of personality, Fowler is just one Ohio State faculty member who is taking a fresh approach to teaching and learning. Here are five things to know about one of Ohio State's innovative faculty members. 1. He’s incorporating virtual reality into teaching. Fowler is working with a team of Ohio State researchers, including project lead Chris Orban at The STEAM Factory, who are exploring ways to use virtual reality to facilitate the learning process. Fowler and colleague Bart Snapp have created an app that allows users to plot whatever 3D vector fields and surfaces they want in stereoscopic 3D on their smartphones. When used with Google Cardboard, the app gives students a more visual way of understanding challenging concepts. Learn more at go.osu.edu/buckeye-vr. 2. He’s a big deal on YouTube. Bringing a high-energy approach to his videos, Fowler owns a math-oriented YouTube channel with more than 20,000 subscribers. These videos feature Fowler discussing and explaining a number of different math conundrums. Videos on Fowler’s channel have been viewed more than 3.2 million times. Check him out at go.osu.edu/jim-youtube. 3. He’s created the most successful online calculus course. During the summer of 2013, Fowler created a Calculus One massive open online course that was made available through iTunesU. That summer, it had more than 150,000 downloads and 186,000 streams, making it one of the most popular courses on the Apple platform. The course is still thriving at mooculus.osu.edu. 4. He gives a great TED Talk. Fowler’s TEDx Talk “The Humanity of Calculus” covered his desire to improve the teaching of calculus and make it more accessible for a broad range of students. His presentation focused on calculus’s backstory, the people who brought it to the forefront and how it can be used to better understand math. Watch the video above and at go.osu.edu/humanity-calculus. 5. He’s helping make college more affordable. Fowler and Snapp received an Affordable Learning Open Impact Grant from Ohio State. 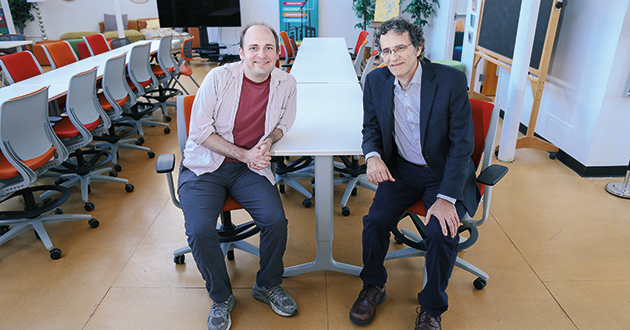 With their grant, Fowler and Snapp are exploring moving a three-semester sequence calculus textbook online, something that could save students more than $250,000 in book costs. Learn more at go.osu.edu/affordable-learning.